​ It was mostly a travel day for us. 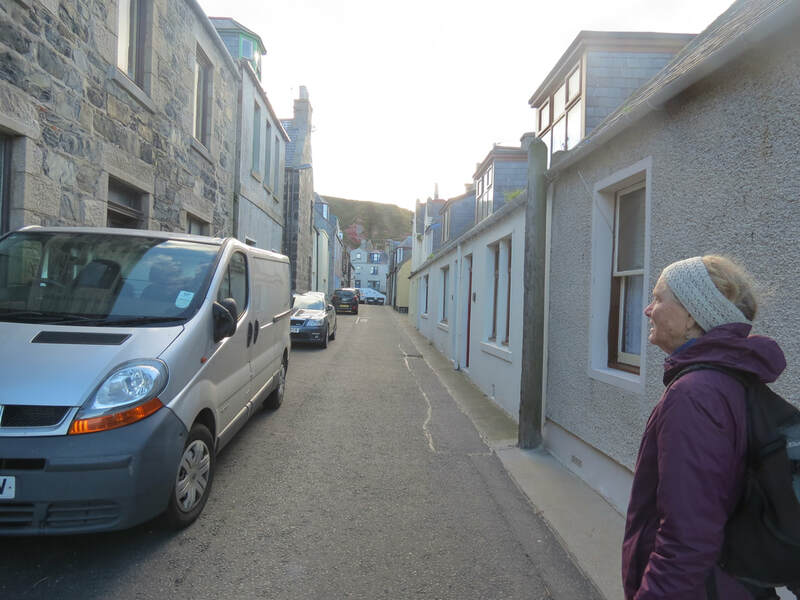 The ferry from the Isle of Eigg dropped us off in Mallaig, a town we were already familiar with and so we could readily accomplish errands as well as have lunch before catching a bus to Fort Williams, change buses, and continue on to Fort Augusta. 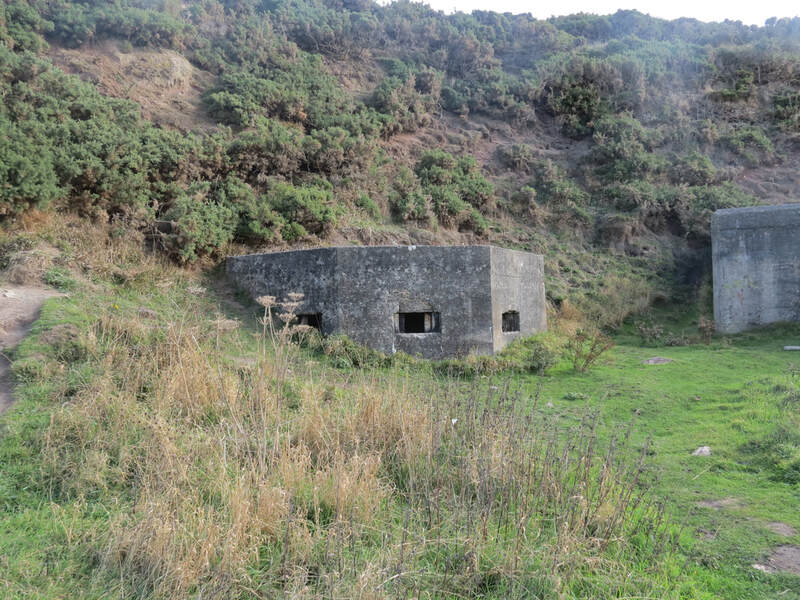 Fort Augusta lies at the end of the famous Loch Ness. 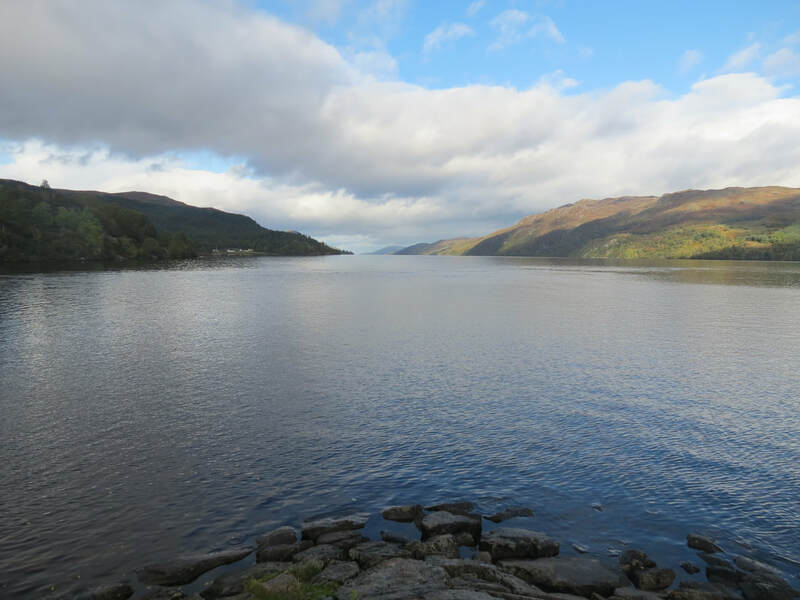 Loch Lochy and Loch Ness are both long thin bodies of water connected by the Caledonian lock system which allows boat travel between the east and west coasts of Scotland. Thomas Telford, an extremely focused man, engineered this great undertaking in the late 1800’s. The project had a social aspect in that it provided jobs for unemployed men during the hard times of that era. Money was extremely tight then and the workers had to bring their own shovels to dig the canals and the earth was moved using wheel barrels. After settling into the Morag's Lodge we walked down to the locks and around town then headed back for an early night. ​ The next morning we saw the lock system in action. A crowd had formed around the final lock before entering Loch Ness to watch a boat being lowered. 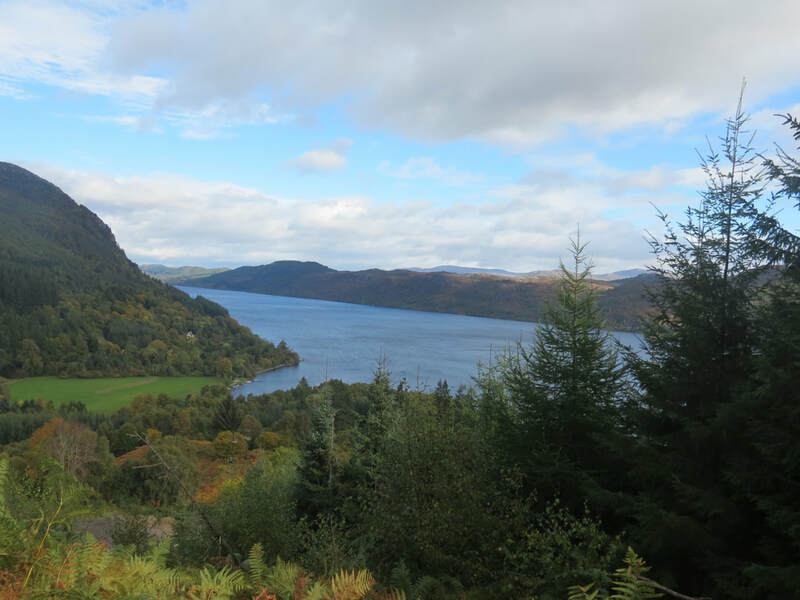 Once the boat made it through we went back to the lodge and packed our day packs and started up the high trail of the Great Glen Way above Loch Ness. 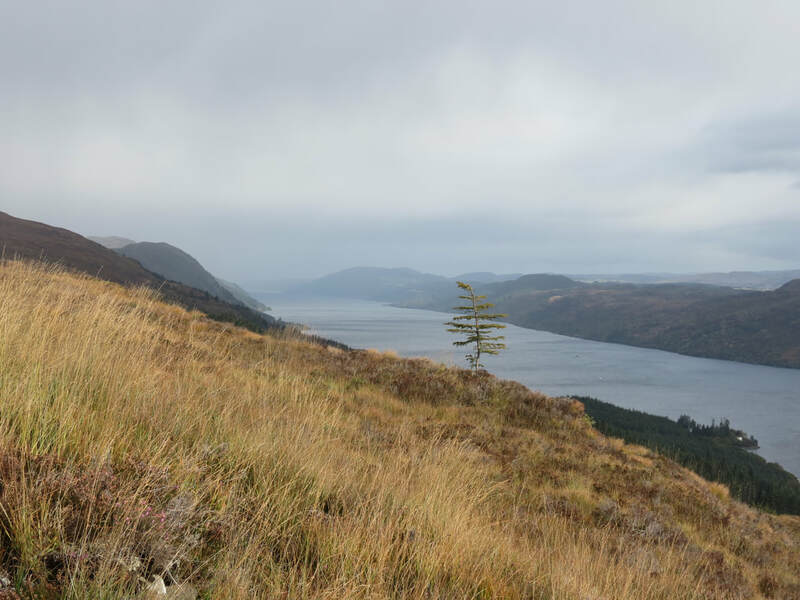 The trail was steep at first, through huge pine trees and babbling burns leading out to the high open ridge with stunning views of Loch Ness. Hiking allows for periods of time to walk along without talking and these times are perfect to contemplate different topics that there is no time for in the daily routine. There is no media distractions, no new information from a device, no one giving advice, just your own thoughts. Hiking and biking are physical experiences that stimulate not only muscles but also your thoughts. It is time when old information can be connected into a whole picture. Is there information that doesn’t fit at all into the whole picture or with a little more thought and adjustment fits? Science in recent years has gained evidence that physical forms, along with lifeforms, are working together to maintain a balance. 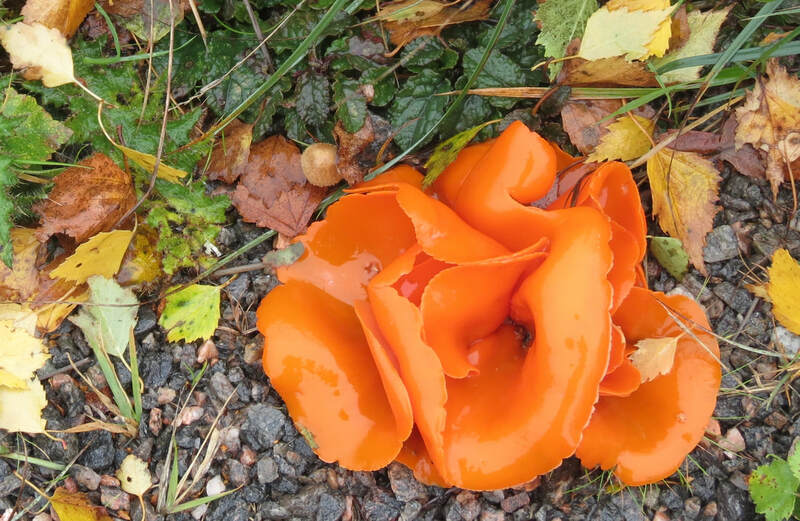 In the past we saw different lifeforms in competition and isolated from the physical forms. 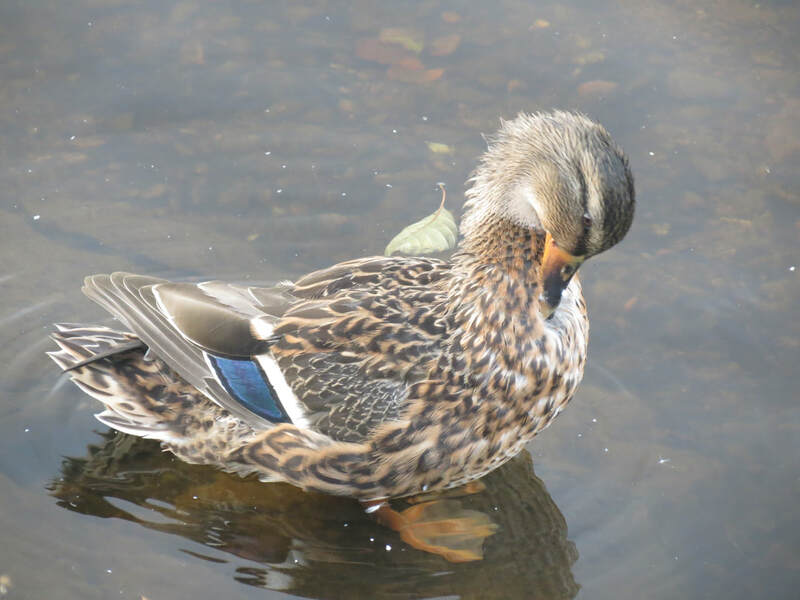 It has taken many years of thought and hard work to begin to find the connections between lifeforms (plants and animals) and the physical forms (rocks and minerals) creating this balance. At first different aspects, many times, seem unrelated, in other words, investigation can lead to connecting the dots between what seems to been completely separate aspects. Could it be that the evolution of human consciousness can lead us to find the connections between environmental issues, history, economics, poverty, etc? The constraint to this progress is the existing paradigm, a kind of blindness to new information that seemingly does not fit the present picture. Looking out into nature, science is finding more and more evidence of cooperation,instead of competition, as more of the driving force behind evolution. At the present time period much of the new information fails to fit the old picture and it may be time to draw a different picture, one where the social and cultural aspects cooperate with the environment. To establish and maintain a new image the habit life of the populous will have to change. 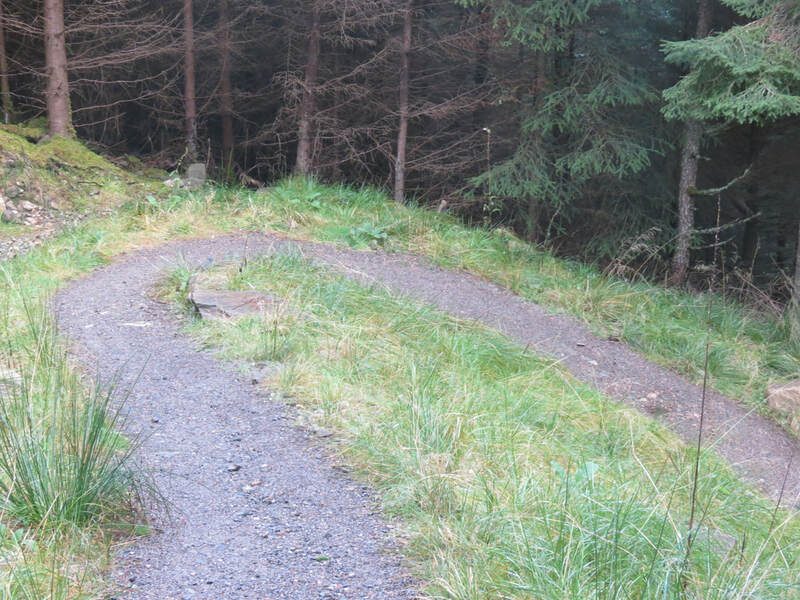 After seven miles or so the trail leading down to the town of Invermoristin was so steep with many switchbacks. 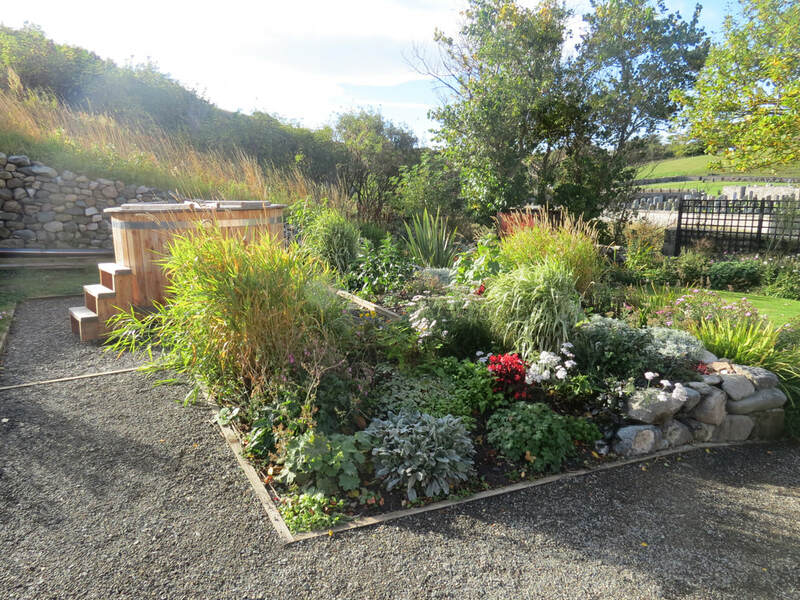 As we walked through the town we saw another one of Saint Columba’s healing wells and then onward to the bus stop where we could connect the dots by traveling from Invermoristin to Fort Augusta and back to the lodge. 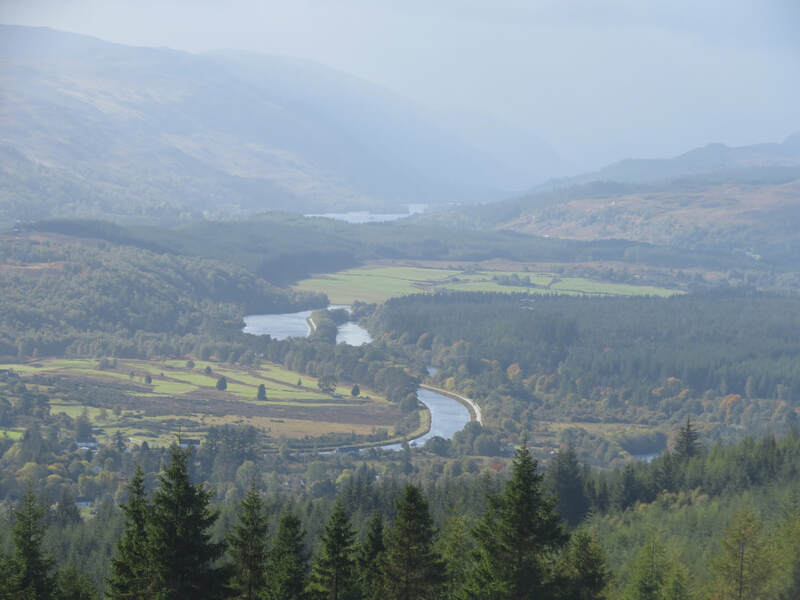 -​ As soon as we entered the lodge we met Kevin and Kelly, two travelers from Washington State who were bicycling along Loch Lochy and Lock Ness on their way to Inverness. It is always exciting to hear about other’s challenges. One of the many things I loved about Scotland is the narrow roads and how much courtesy is involved in moving over and waiting for other’s to pass, however, this can result in scary situations for bicyclists. We have talked to several bicyclists and although they remain nervous the people driving cars seem to be aware of bikes and give them the same courtesy as autos and they move over giving bicyclists their space. We talked about our experiences and the advantages of traveling at a slow pace. After a good night’s sleep we were up early and started on our way when we ran into Kelly and Kevin once more. The conversation picked up and flowed easily once again but came to a quick end when we all realized we had to get on the road to get to where we wanted to be that day. 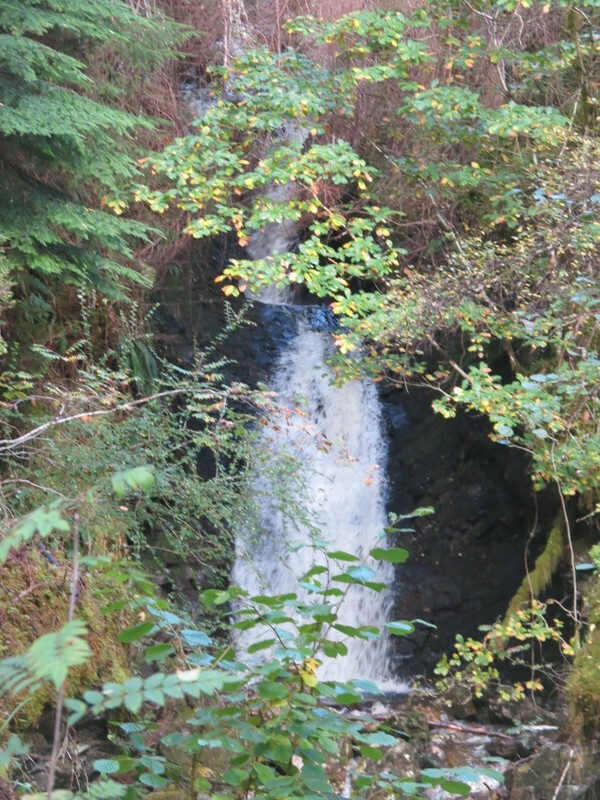 Mary and I were leaving the Highlands on a bus traveling first to Inverness, then on to Forres by train where we began our exploration of Northeast Scotland. Forres is a beautiful town with stone buildings that are centuries old. We found a small cafe for lunch where we found out how to get to the Waldorf School that we intended to visit in the next few days. 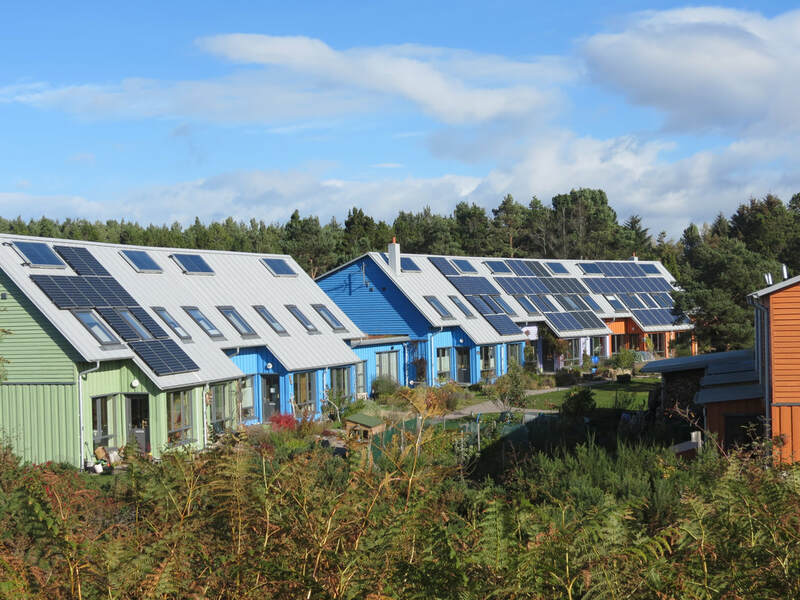 Our immediate plans were to travel to the village of Findhorn and stay at the Findhorn Hostel and Village Centre. 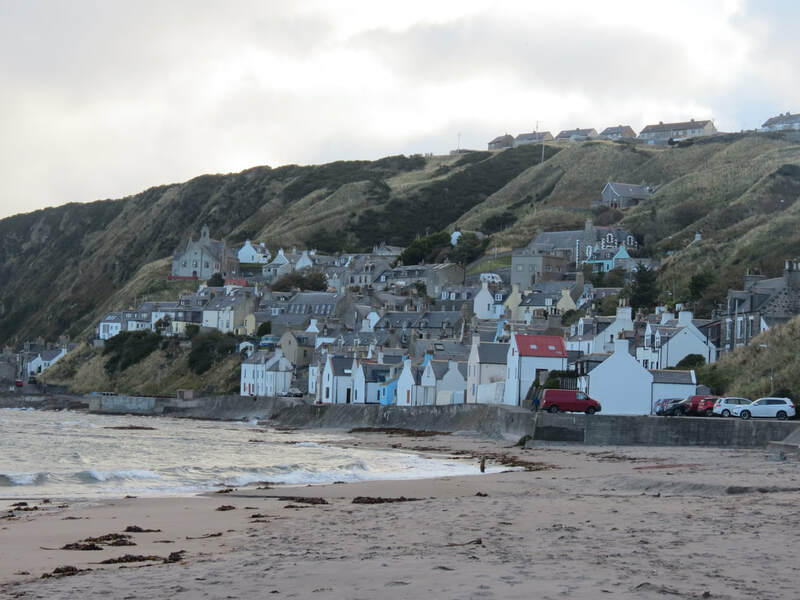 The village had been destroyed once by high water and once by encroaching sands that covered the town. 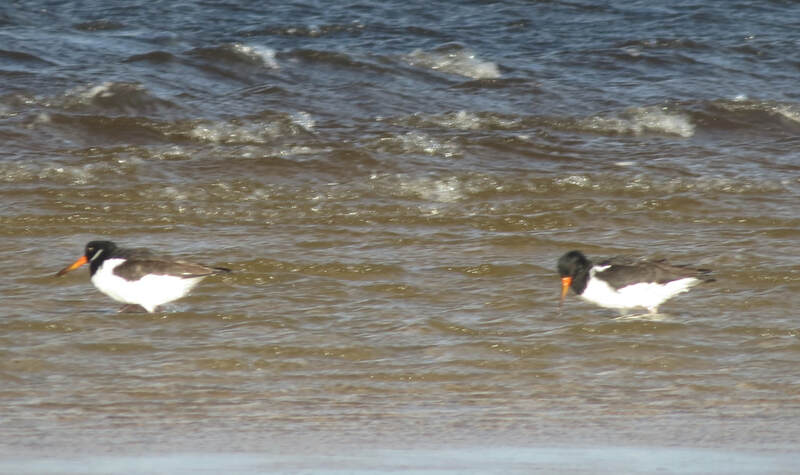 The present village of Findhorn is now in a different place separated from the older towns by a body of water. 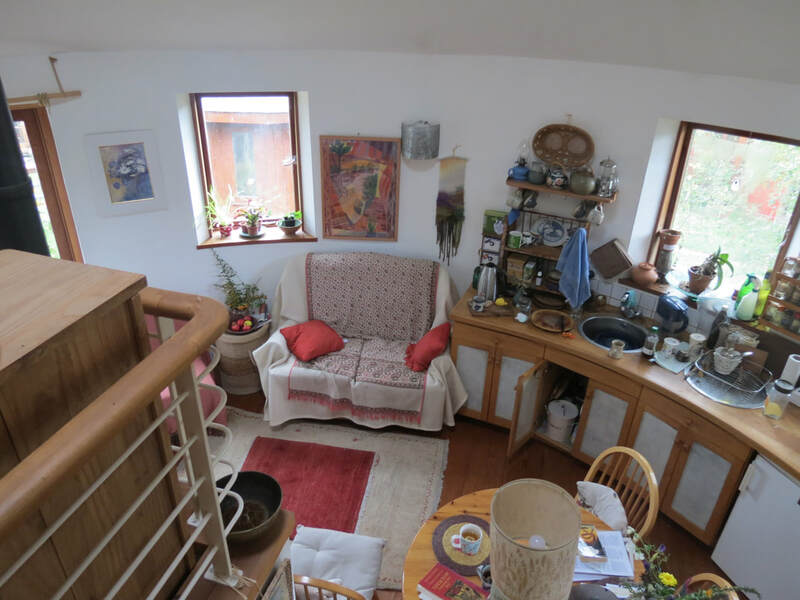 It was the famous eco-village of Findhorn, where an intentional community has developed an alternative way of living together, that Mary and I wanted to visit the most. 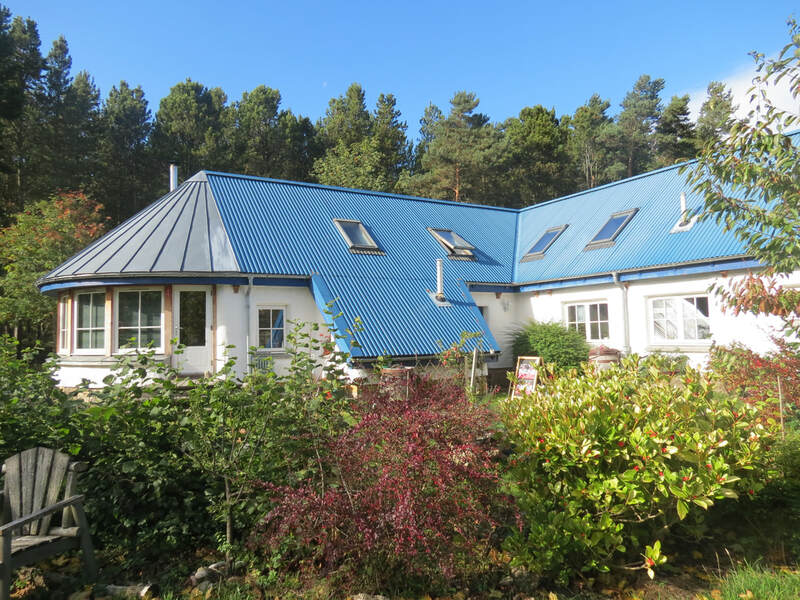 After taking a bus to the village of Findhorn we moved into the hostel. Our room was in a new add-on building, the Lobster Pot, and everything was very modern and electric. Even the lock on our door had a keypad with our own private combination of numbers and letters to open the door to make sure no one would steal our beat up hiking gear when we left. It didn’t take long to discover that this new building had no, or at least very little, heat. We ate an early dinner and went walking around town to warm up and get our blood flowing. Before we left we made sure all the lights were out, after all, we had to feel like we were saving electricity. Mary and I often walk around towns to see the different architectural designs which can vary from culture to culture. Time passed quickly and we soon found ourselves walking back in the dark and when we got back to the hostel no one was there. We were the only occupants staying there and the host had gone home. Walking up to the door we realized that we couldn’t see the numbers and letters on the keypad. Mary and I both tried our hand at remembering the keyboard pattern and pushing buttons with no success. We were trying different techniques, such as letting our eyes adjust to the darkness and looking at the keys from different angles, when Mary noticed a yoga class in the building next door. One of the participants saved the day with his smart phone providing the light we needed. ​ It had been a cold night and we were glad we had our sleeping bags with us to bundle up in. In the morning we had coffee at ‘home’ and left early to find a warm café where we had breakfast along the shore of the bay. 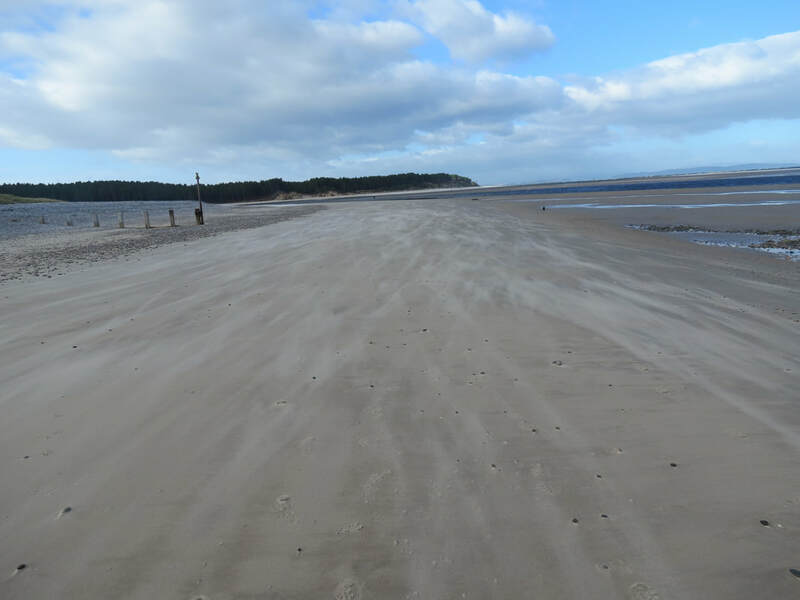 Continuing onward, we walked down the beach back to the hostel then took off in the other direction to hike along the bay to the eco village of Findhorn. Throughout the years I have read many articles of this famous community and now we could find for ourselves what the myth is and what the reality is. We walked into the entrance where there was an area with many caravans, or trailers, providing residential housing. We were warmly greeted and our many questions were answered at the information center, located not far from the entrance. One of the questions we asked was if there were any Anthroposophists (those who explore Steiner’s philosophy) in the community. She told us that Auriela, a retired Waldorf teacher has been a part of the community for over 25 years and lives in one of the original barrel houses and welcomes visitors. 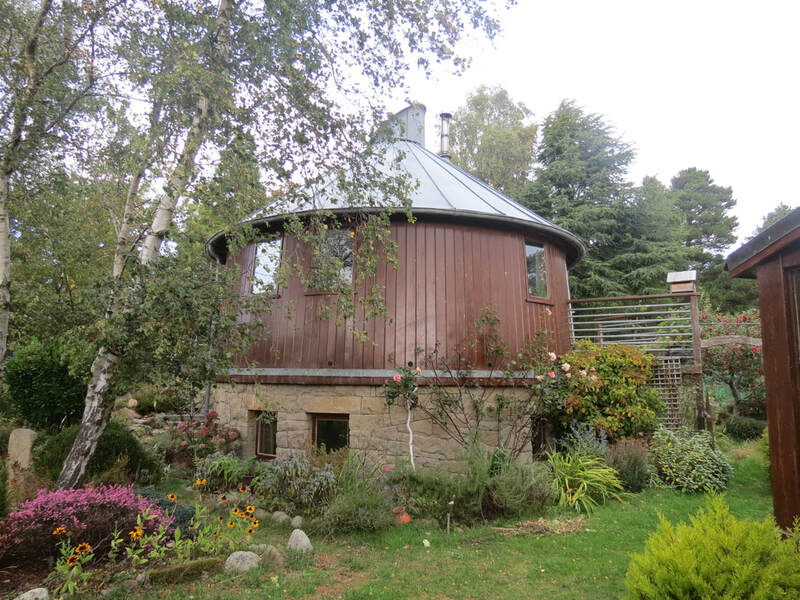 The barrel houses were made from gigantic old whiskey barrels and were all sited in their own area at Findhorn. On our self-guided tour we passed by small sections of trailers, other areas of very interesting architecture, followed by modern housing, and many of the buildings had solar panels on the roofs. Winding our way towards the barrel houses, we saw an open tent structure where a group of men were working and our curiosity was sparked. 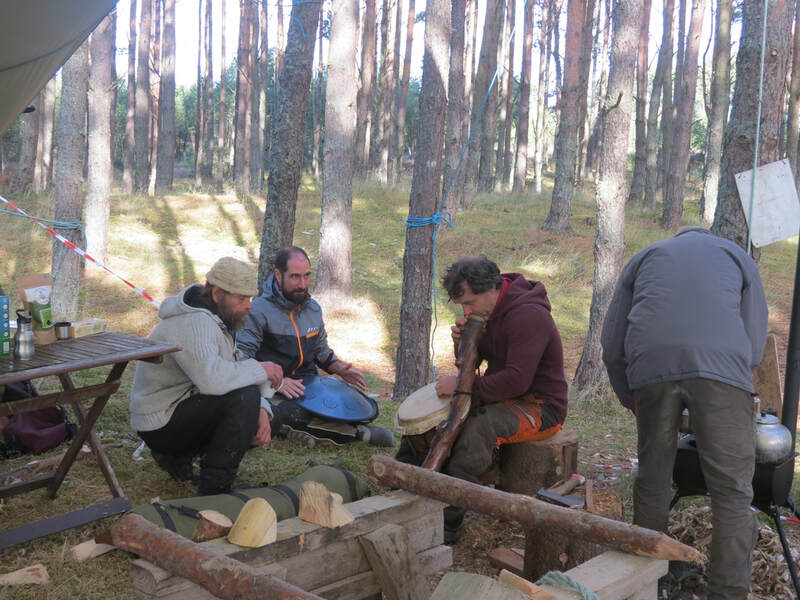 As we entered the tent we could see that they were cutting out a log timber frame for some kind of structure. Henry, the head of the project, walked over and explained what they were building. 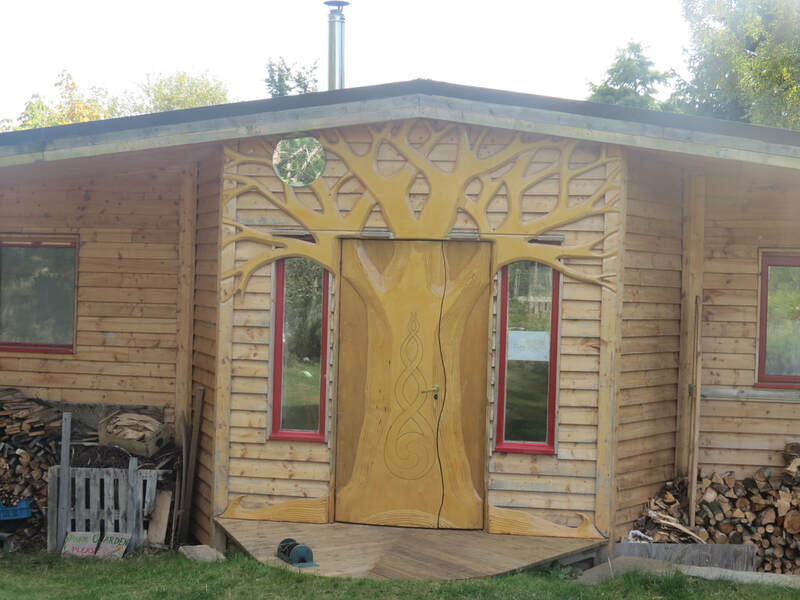 He was using a laser light to determine where the joints had to be cut along the log and that this was part of a structure that would become a woodworking building for the Findhorn community. Off to the side was a small wood stove where they were using scrap wood to warm up and to make tea and lunch. The workers made time to discuss the project and soon it was time to break for lunch. 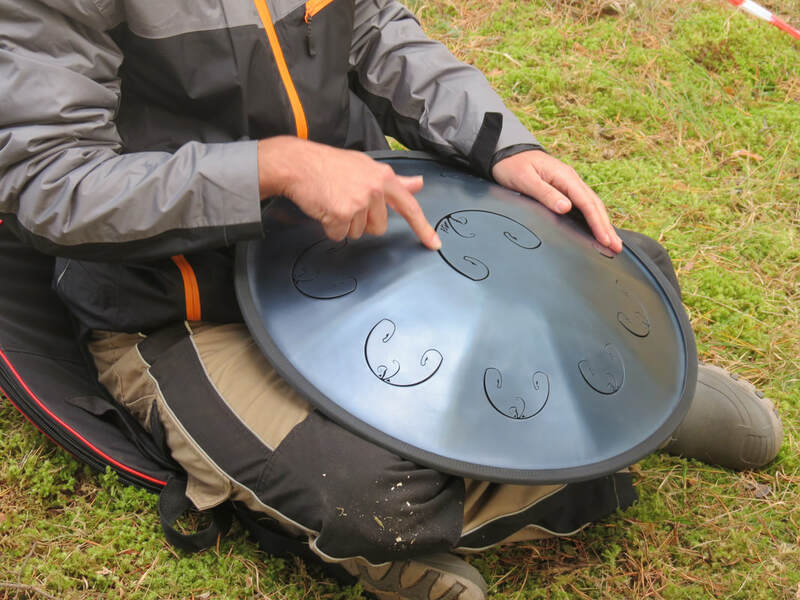 Henry picked up his didgeridoo and started playing while another man added to the music with his Russian kettle drum. It was a great impromptu concert and they finally put down their instruments and we said our goodbyes and let them eat in peace. On we walked towards the barrel houses. There were five or six barrel houses in this section and after looking at them we made an educated guess on which house was Auriela’s. After knocking, an older woman answered the door and we introduced ourselves and she invited us in. In spite of her age her eyes sparkled with enthusiasm. She made tea from her herbs and cut up apples from her garden and we sat down and conversed. 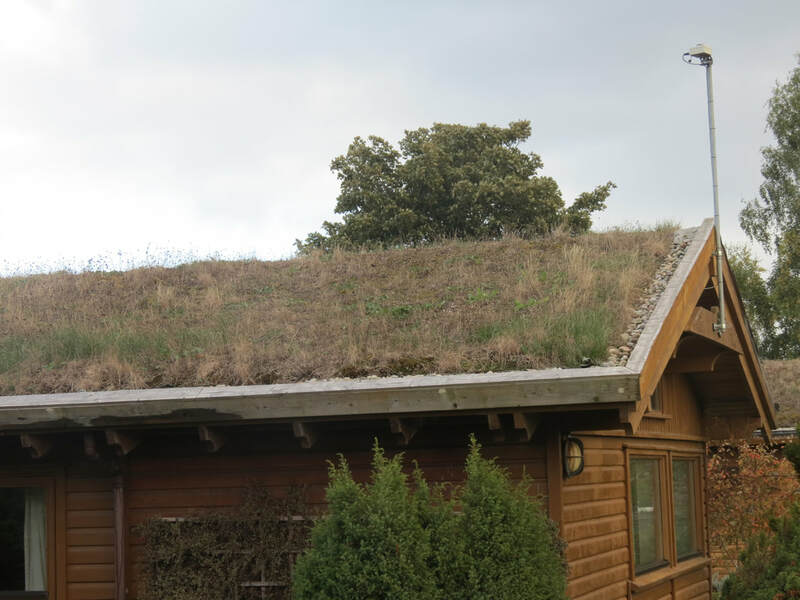 There was so much to discuss, gardening, building, community life, Anthroposophy, etc. and as time slipped by our conversation turned to global issues and the worldwide turmoil. 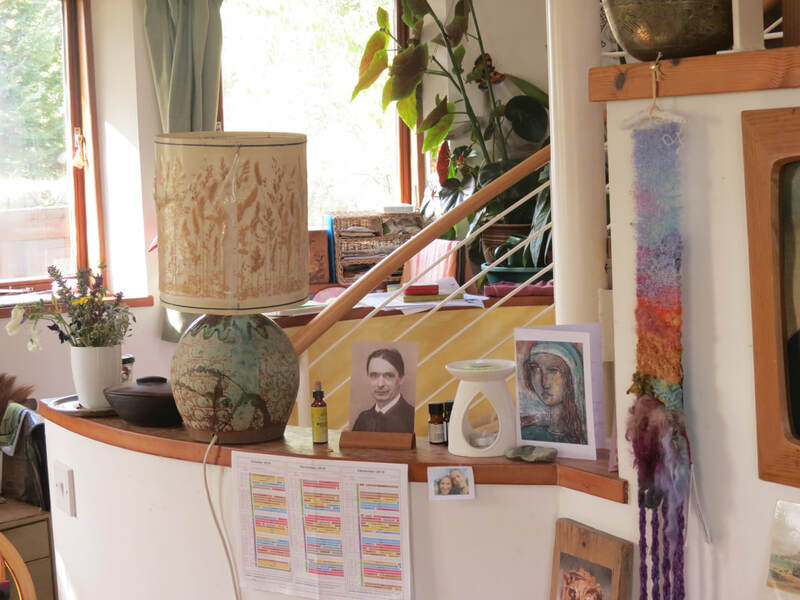 Reincarnation is part of the Anthroposophical belief and also we have all chosen to be here in this time period, although as I was about to find out, there can be variations in this belief. I leaned over to Auriela and said, “Well, you know, we all chose to be here at this time.” She was quick to answer, “I don’t know if we chose to be here, but we did say yes.” Well, that’s a different interpretation! At the end of our visit Auriela gave us a tour of her house. This small house that she has lived in for so many years still gives her joy. We moved outside into her garden where she picked apples for us to take along. When we left Auriela’s yard I had to look back when she called out, “WE SAID YES!” as she stood there smiling with both thumbs high in the air. Mary and I walked in silence for a time. It was hard to even talk about the experience we had in Auriela’s barrel house. 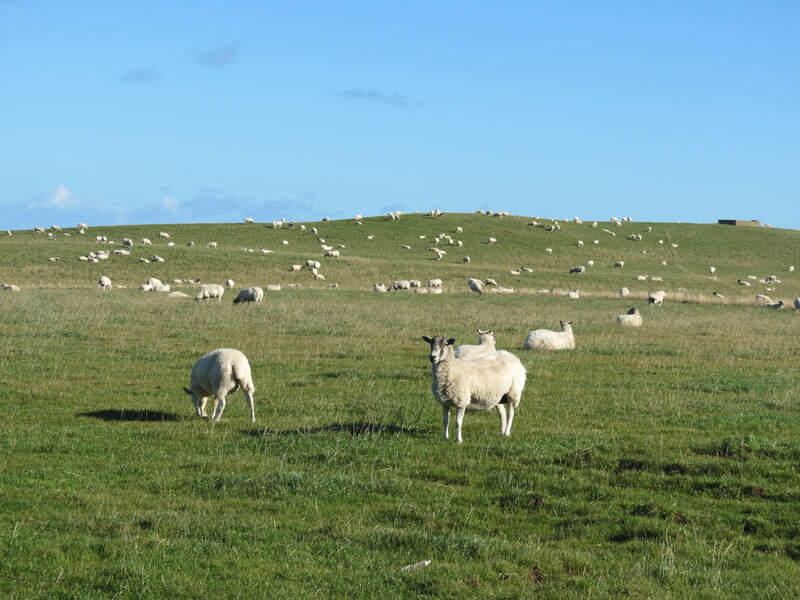 We came to a junction in the road and had to come out of our trance and look at the map so we could make our way to the Cullerne Gardens, a part of the community that over the years has expanded to about 25 acres using biodynamic and organic methods. Making our way down the path and through a gate we entered the gardens where we met Mark, the garden manager, trimming a hedge. Mark stopped his work and took the time to answer our questions. As we were talking an apprentice (a man who had retired) walked up and said that he needed some stompers. Mark turned to Mary and me and asked if we wanted to help and within minutes we were at the end of a tunnel (hoop greenhouse) along with several other men and women all with locked arms with each other forming a line. The apprentice gave out the directions, “Everyone walk with your toes pointing out and walk like a penguin “. Everyone started walking at the same speed while the apprentice encouraged us to sing a stupid song making us all laugh while we stomped the ground. When we reached the end of the tunnel we turned around and stomped back. After we finished I turned to the apprentice and said, “I hate to ask, but why are we walking like penguins over the garden area”? He told us that the soil is so light that new plants have no stability and the soil needs to be compacted for the roots to take hold. This was such a reversal to our gardening where we worry about compacting the soil. It was tea time and we were invited back to the tool shed. 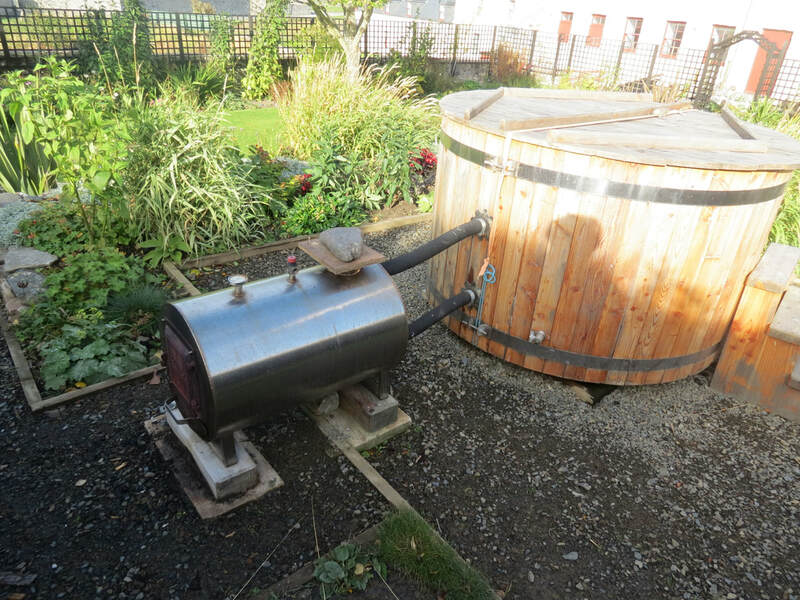 The topic up front was gardening and it was there at the tool shed where our tour of Findhorn ended. Before we headed to the village of Findhorn on an alternate route another apprentice gave us directions that led down to the beach where we could avoid the main road. He said, “Make sure you go the right way, people can get lost in the dunes”. I asked him to repeat them and Mary and I listened carefully before we made our way back through the dunes and into a howling wind. It was quite amazing to see a group of people with many philosophical beliefs create such a vibrant and interesting community. 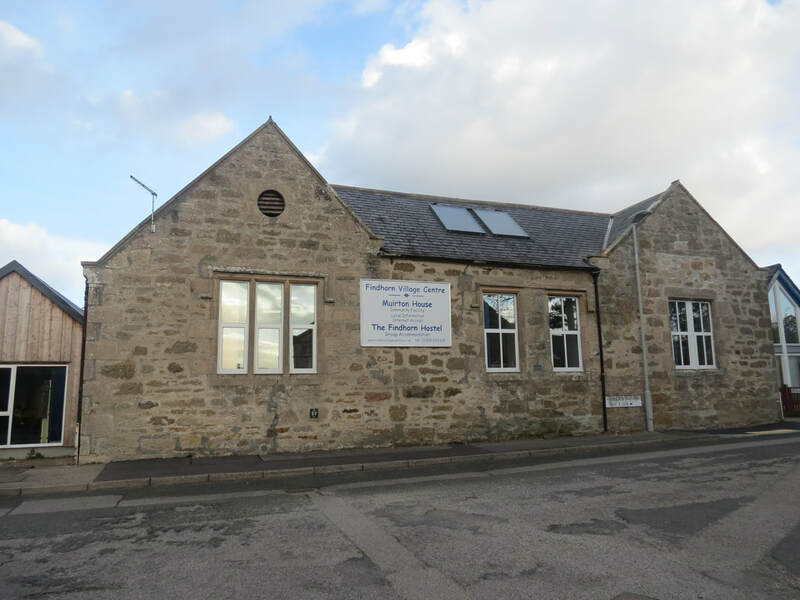 The next morning we headed back to Forres with our backpacks to visit the Drumduan School (Waldorf School). Again, with a warm welcome, people took time to show us around and answer our questions. After the indoor tour Mary and I walked around the outside grounds and admired the simple playground. There were ropes tied around trees where children could develop climbing skills. The playground looked more like the playground I grew up with. 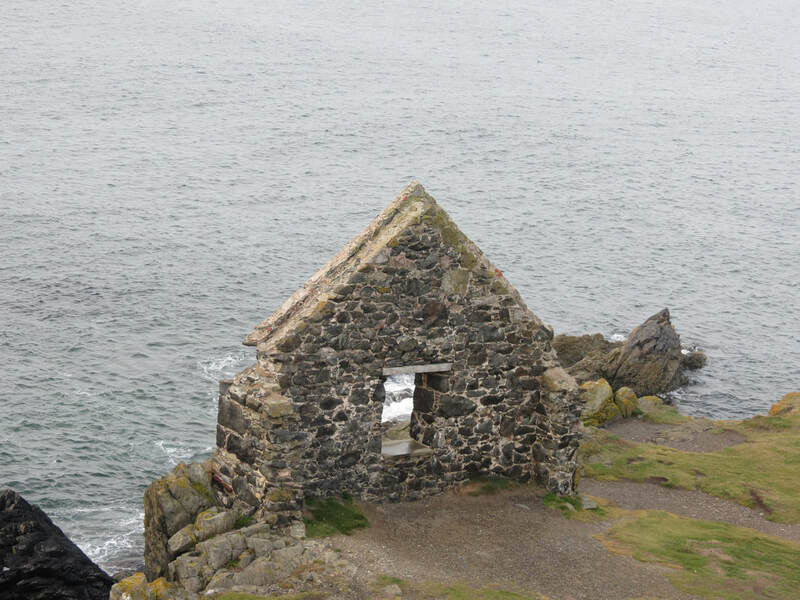 At some point during our travels someone suggested we visit the town of Portsoy so Mary booked a room at the Sail Loft Bunkhouse which dates back to 1768. 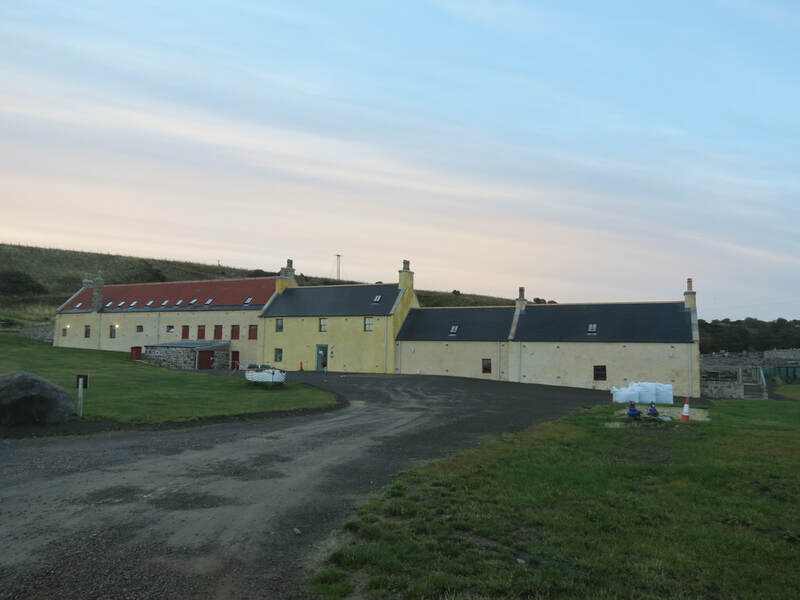 This lodge was recently restored and renovated, and had recently won the Scotland Architectural Award. The next morning Mike and Irene, the hosts, gave us advice on what to see in the area and so after breakfast we set out. 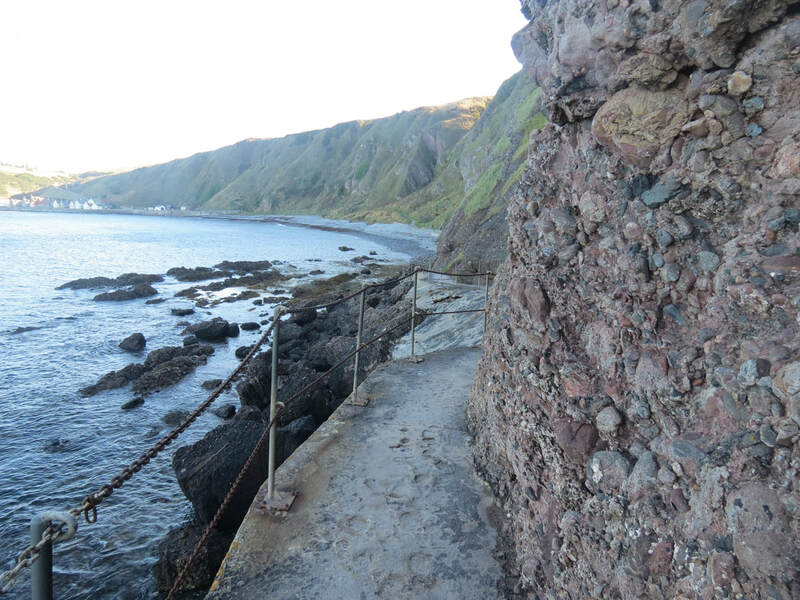 Walking through the town we passed the fishing center and harbor then continued on a trail along the dramatic coast, high on the cliffs overlooking the sea. Along the way there were steep switchback trails heading down to the water and finally we took one that brought us down to an old salt water pool that was no longer used. Sandsend, a small fishing village, was the next town and from there we planned to visit Findlater Castle. Sandsend was quite different than Port Soy, the buildings were much simpler and not as old, it was still a working town. We walked through town and headed towards the main road to catch the bus to the castle. As we walked a car pulled over and a woman leaned out and asked, “Are you the Americans staying at the Sail Loft”? Wow, we’re famous! We said we were and introduced ourselves to Sue, a good friend of Mike from the Sail Loft. 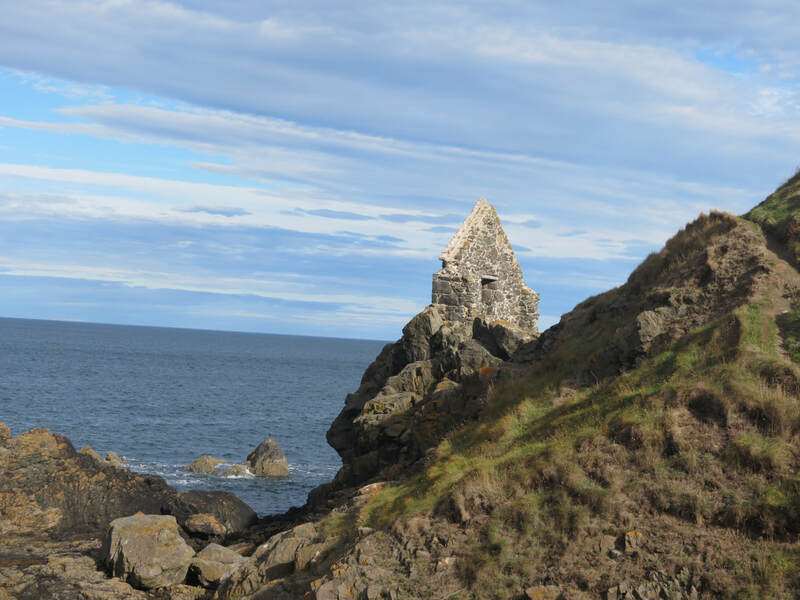 She offered to give us a ride back to Portsoy but we told her we were headed to the Findlater Castle and Sue said she would take us there. We hopped in and after driving down the main road for a few miles, Sue turned onto a dirt road, then made a few more turns before turning into the parking lot. 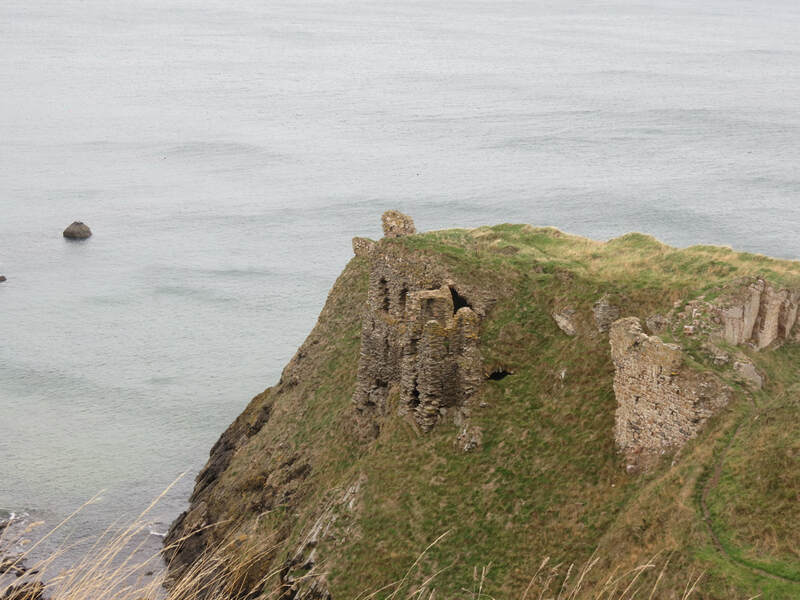 Mary and I realized we would never have found the castle without Sue’s help. The parking and overlook was on a high cliff and the path down to the castle appeared to be quite precarious. I wanted to go but Mary was sure she was satisfied seeing it from this distance and I didn’t want to take more of Sue’s time. Sue then perked up, “I’ll go down, my father took me here when I was little and I haven’t been back since.” We headed down the steep narrow path and Sue (originally from England) said, “If this was in England there would be signs that said danger or keep out”. I replied, “If this was the US there would be danger signs, steps, fences and someone at the top selling tickets”. Again, we were the only people at this incredible site. We reached the castle remains perched on the side of a cliff and I wanted to enter one of the rooms. My conclusion was that these stones had stood for a thousand years and the chances of collapse at that moment were slim. 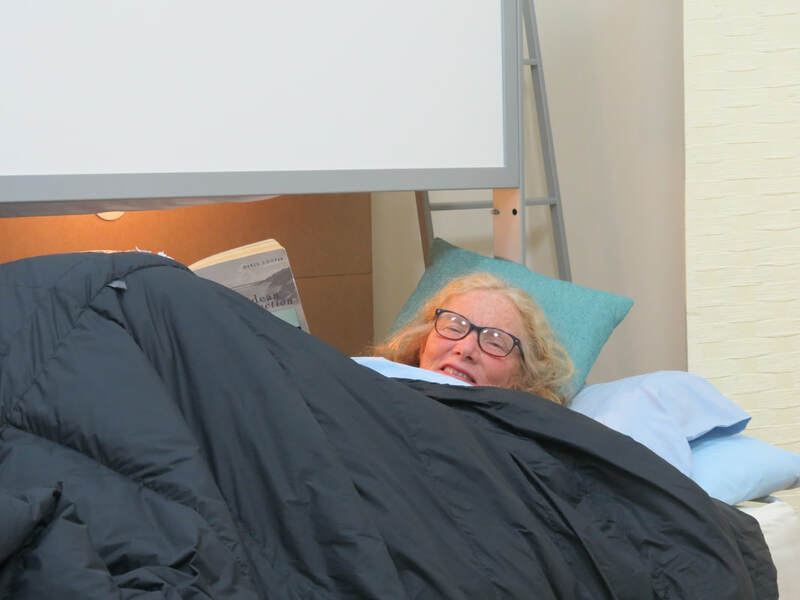 Before I enter the room Sue reminded me that the door opening on the other side of the room led straight down to the rocky sea. We both marveled at this structure, ‘what kind of people could build this, and how?’ As we were leaving the parking lot Sue asked if we had visited a distillery yet and we said no. Sue said, “Let’s stop at the Glenglassaugh Distillery on the way back to Portsoy”. Since it was off season most of the distillery was not open to tour at that time, however, the young woman in the welcome-information center provided information about the distillery and answered many questions. Sue drove us back to the Sail Loft and dropped us off. Many thanks for helping us out Sue, it was so much fun. ​ That night we ate in a local restaurant where there was a group of men from France talking at a nearby table. Everyone was laughing and having a good time and I couldn’t help overhearing some of their conversation and even partially understanding some of what they were saying. Mostly they were discussing the area and how much they were enjoying themselves. 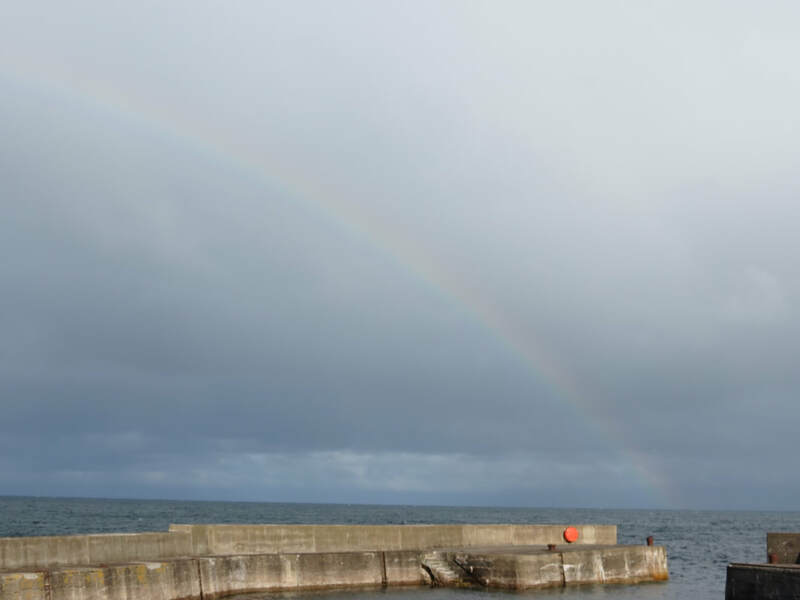 At that point I couldn’t see the significance as we finished our meal and headed to the hostel for our last night in Portsoy. We were up early and walked to the bus stop. When you are in the United Kingdom waiting for a bus it is important to wait on the correct side of the road. I say correct because if you stand on the right side of the road you are actually on the wrong side of the road. It’s seems like such a simple idea, but, if you have spent your life in the US and now you are in the UK, you spent your time trying not to get into the wrong side of the car, and looking the wrong way which is so dangerous, and the left- right thing appears every day in some form or another. I bring this up now because it was early and our first real discussion of that day was which side of the road we had to stand on to not miss the bus. The bus pulled over and by then we knew the sequence; the backpacks are placed in the underneath compartments, make sure this is the bus we wanted, buy our tickets and ask the driver how we would know where to get off. 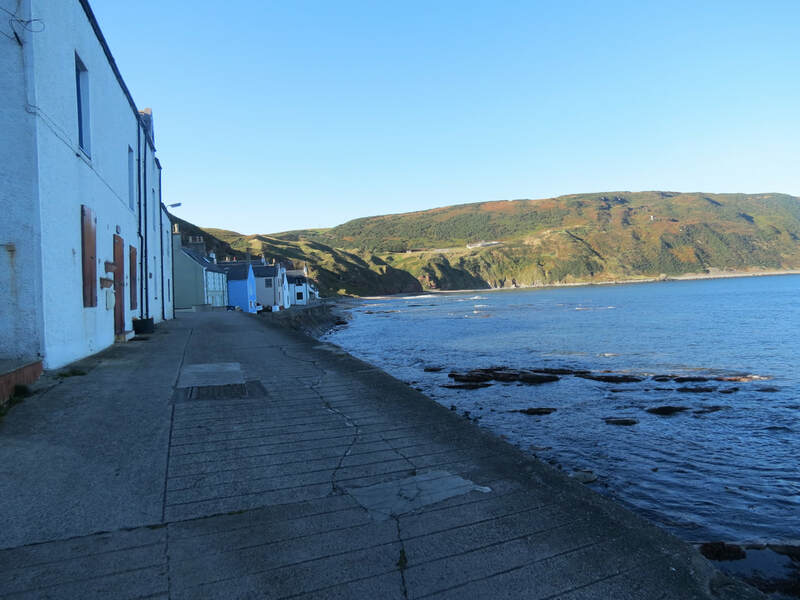 We board the bus and our destination was Gardenstown, a town built on a very steep slope down to the sea. The road down to the bottom of this town is narrow, steep, and had dramatic switchbacks. Mary and I looked out the window of the bus in amazement as this huge bus made its way down the slope. We disembarked at the bottom of the hill and found our way to Kathleen’s B and B. After checking in we went out to explore the area. Before we knew it we were walking towards the town of Crovie (pronounced Crivie) which is also situated at the bottom of a cliff. 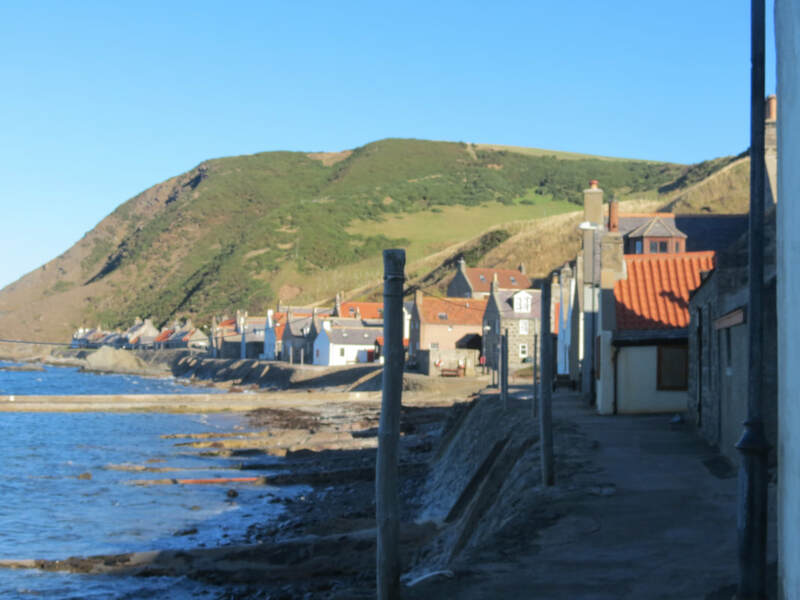 It did not take long to walk to the far end of Crovie and we decided to start walking up hill out of town towards a gannet rookery at Troup Head. At this site thousands of gannets congregate along the cliffs although we had heard that many had begun migrating. After a very steep climb we came upon three farmers standing in the middle of the road. I asked, “Is this what you do all day”? 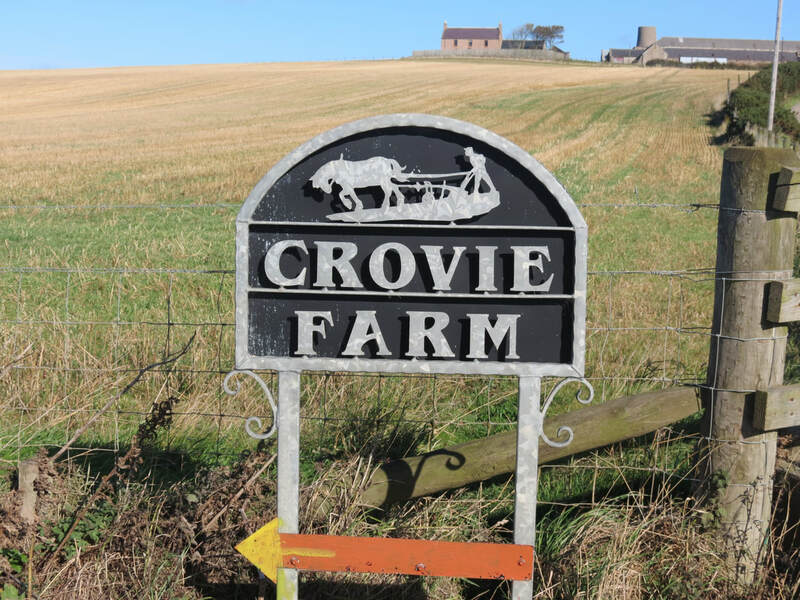 We all laughed and they told us about the Crovie Farm and how the house was built in the 1700’s. With hand gestures, vague directions and the usual, “You’ll know when you see it”, we continued on to Troup Head. 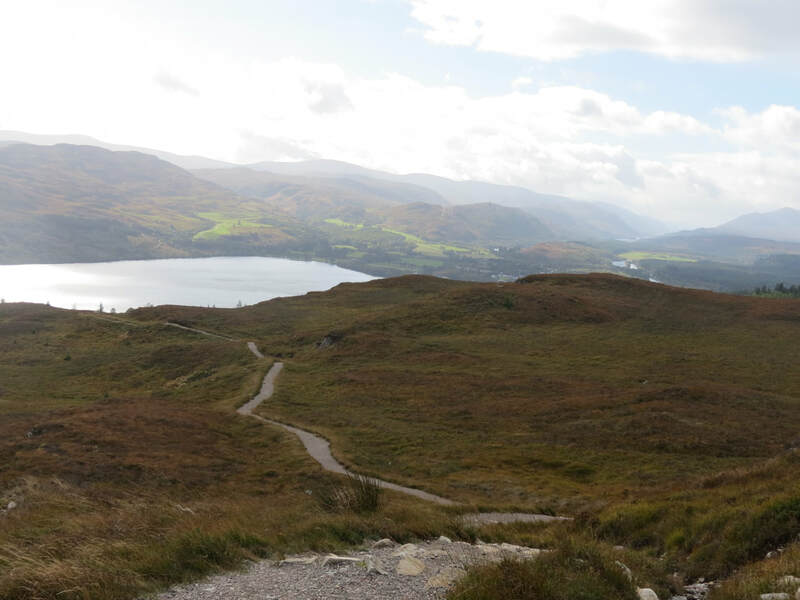 Both Irish and Scottish directions usually seem really vague and while moving towards the destination there is always doubt, then again, Mary and I always have found our destination. I’m not quite sure how that works but it just does. 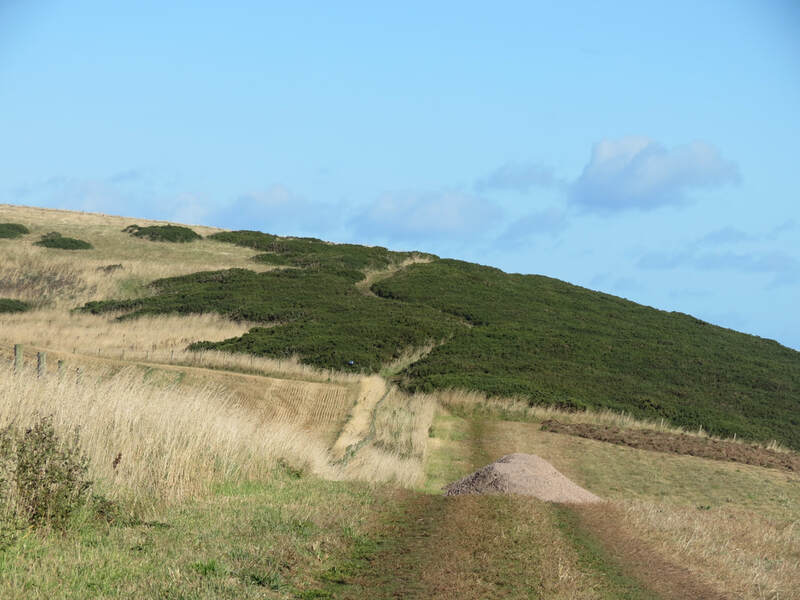 After walking for some time, passing another old farm we reached the cliffs at Troup Head. 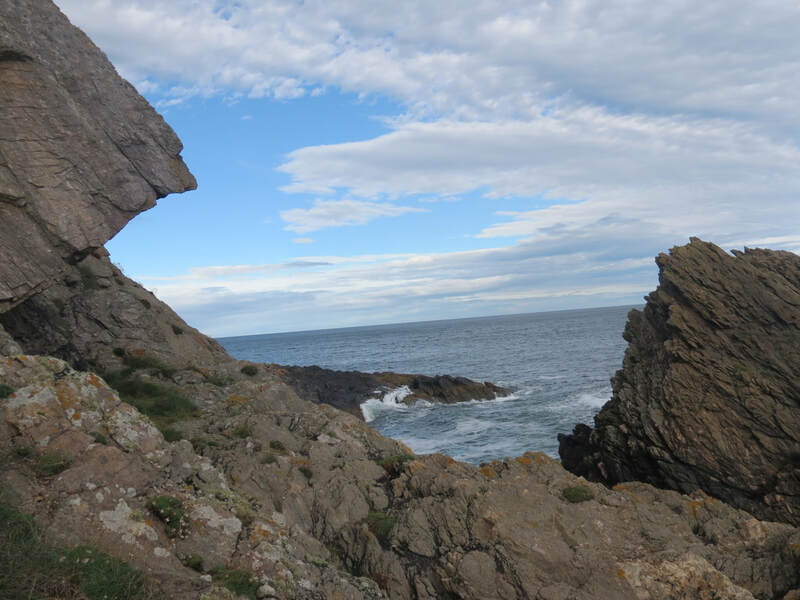 When we first looked at the cliffs we were pleasantly surprised. Although many of the gannets had left on their journey there were still hundreds if not thousands of gannets. Watching the gannets diving, fishing, taking off from the cliffs, and landing on the cliffs and resting became mesmerizing. 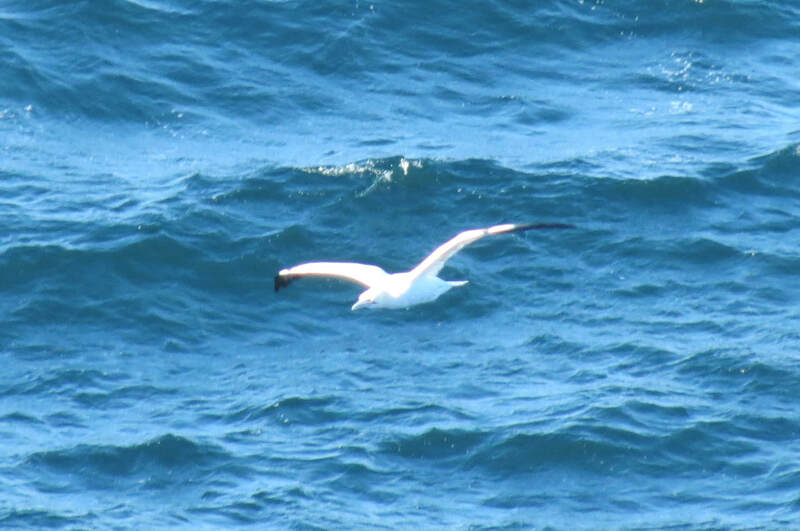 I had been watching gannets in various beaches in the US, always fishing a fair distance from the shoreline and to see these magnificent birds up close was incredible. 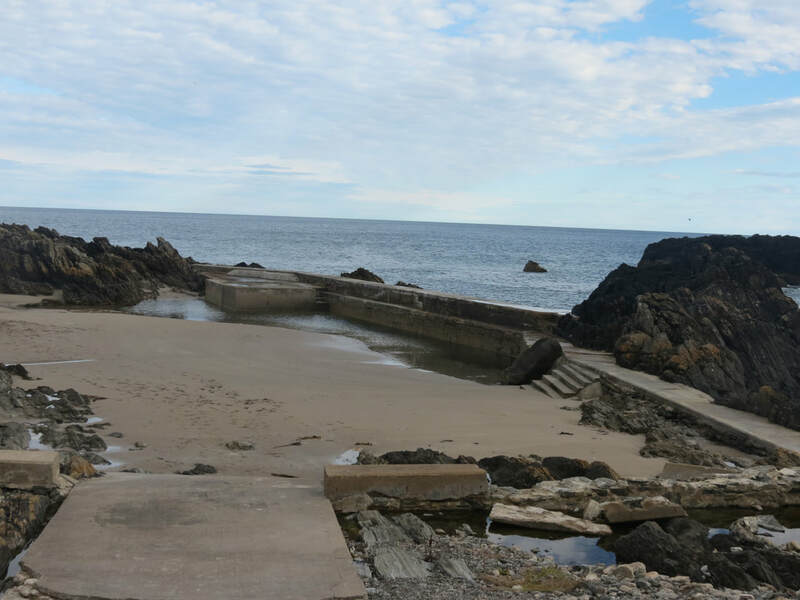 It was a long walk back to Gamrie (the original name of Gardenstown and the name the locals use) and so we said goodbye to the gannets. 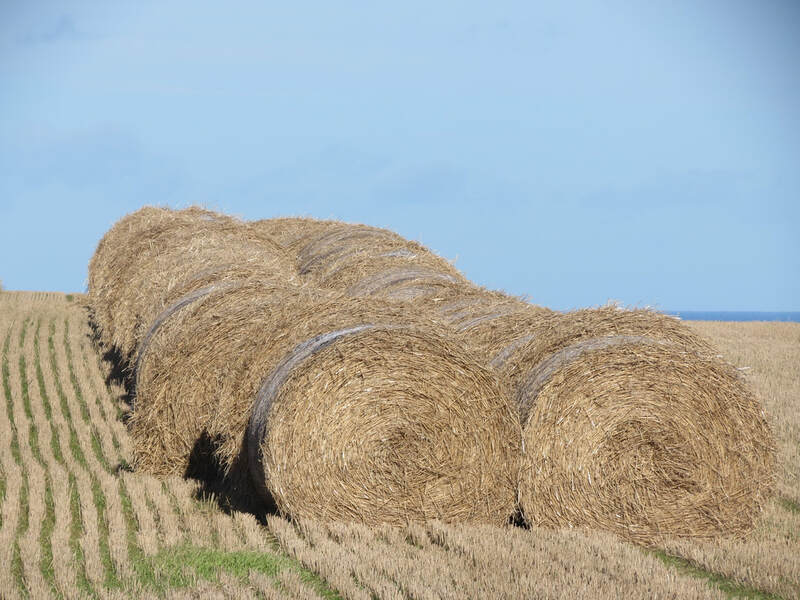 As we made our way back to Gamrie we passed farms raising sheep and cattle and growing mainly barley for whiskey and baling straw that is used for animal bedding. , ​That night we went to the local pub to eat and since it is the only place in town serving food, the place was packed. At one point I started listening to the conversations of the people and I told Mary to listen. Everyone was speaking in a form of English and we could only catch a word here and there. I could actually understand more of the conversation of the French group days before. We have found that some can switch gears and talk to us and are completely understandable outside the use of a new word here and there, while others are more like I am, that they can only communicate in one language. The night at the pub came to an end with discussing education in Scotland with teachers from the local school. The mornings at Kathleen’s B and B began with an incredible breakfast featuring omelettes, bacon, toast, homemade jam and delicious coffee.. After breakfast we hiked up to Saint John’s church which was built in 1004 AD. 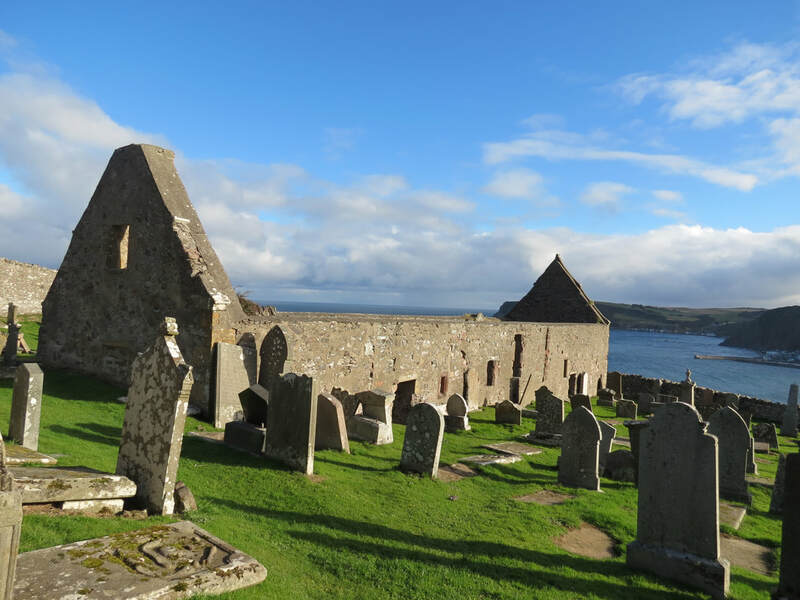 The church was built as an offer of thanks to St. John after the local residents repelled an invasion by the Danes. Inside the wall that surrounded the church was a graveyard and some of the stones were carved with an image representing the work the person had done in life and some of the stones had skull and carved into the stone. 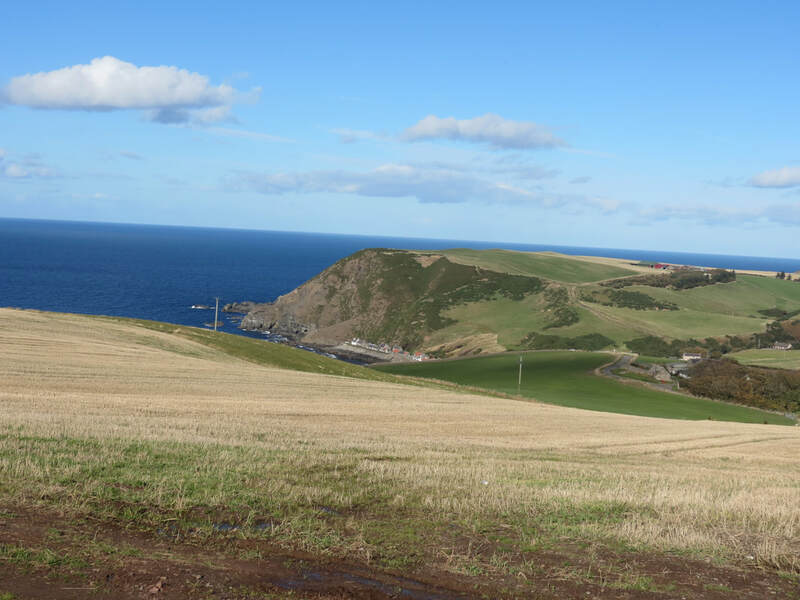 From this vantage point we could see the towns of Gamrie (Gardenstown) and Crovie. 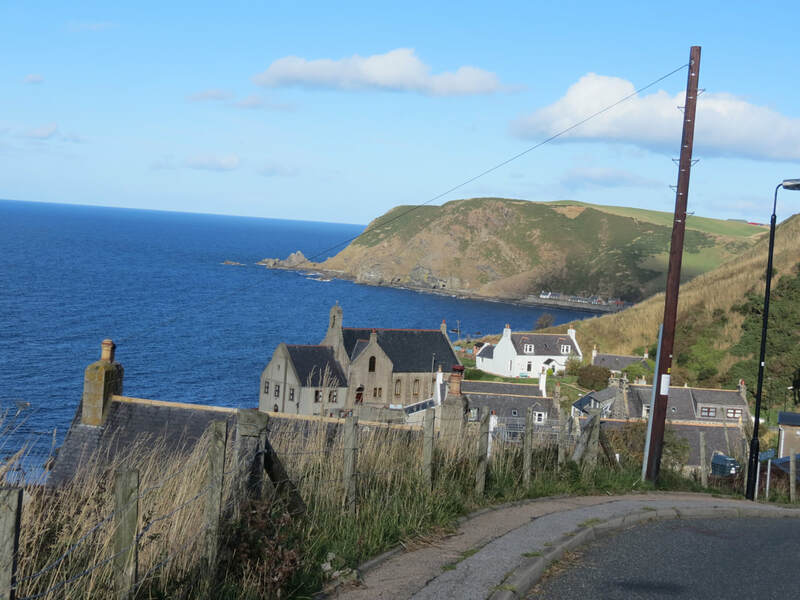 We headed back down to the village, caught a bus and were on our way to Pennan, yet another small village at the bottom at a cliff. 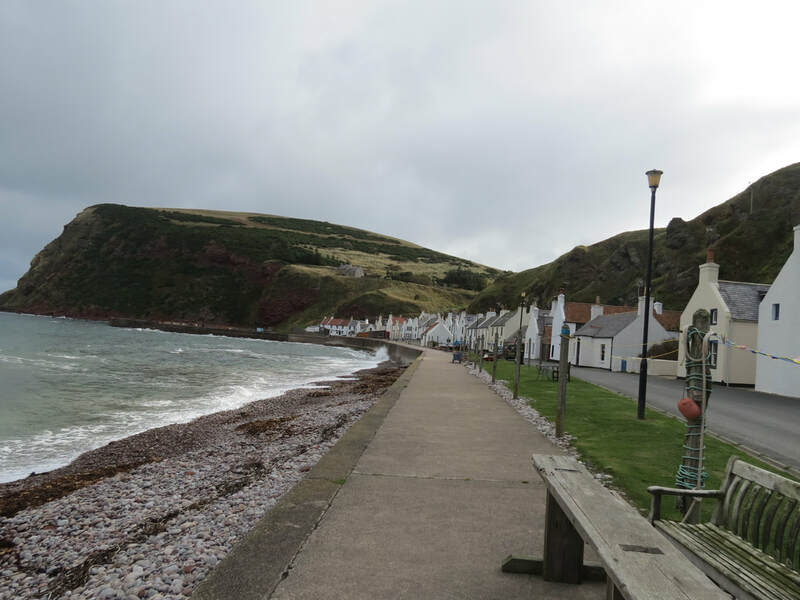 Although Pennan was about the same size as Crovie, the town did have a café to get a cup of coffee and mingle with residents. 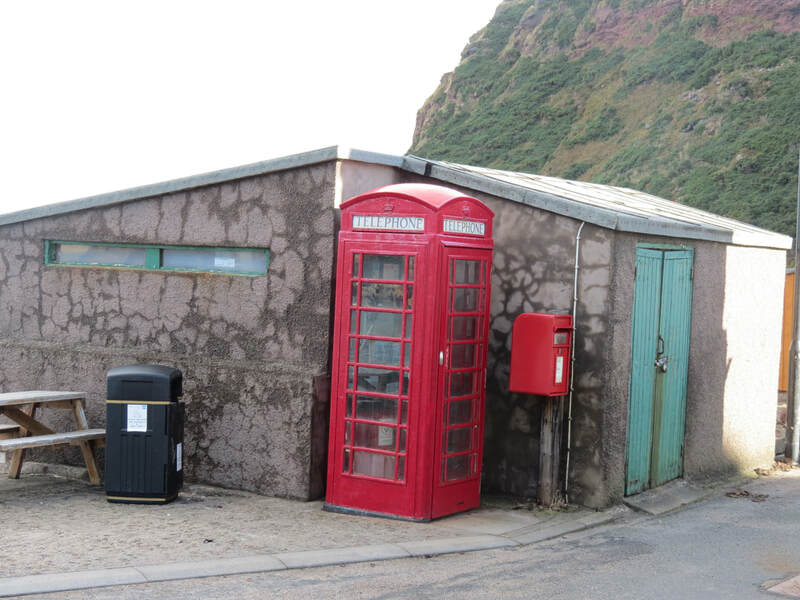 Pennan’s claim to fame is that a scene in the movie Local Hero, starring Burt Lancaster, was filmed in this town in the early 80's and it still has the old red phone booth used in the movie. Since it was a cold day and we were both looking forward to the cup of coffee. Arriving at the café we found out it was out of business so we walked to the end of town, turned around and continued past the famous telephone booth and down to the other end of town, which was not far away. We passed a man driving through town and he stopped to talk to us. It turned out he had grown up in the area and was looking for an old friend and he told us a story of when he was young and the pub was a place everyone would gather, and even when the owner was closed for business, the door was unlocked allowing the residents to still be able to have a place to go. At one point his uncle had lost his license to drive and so he would ride to the pub on his horse. 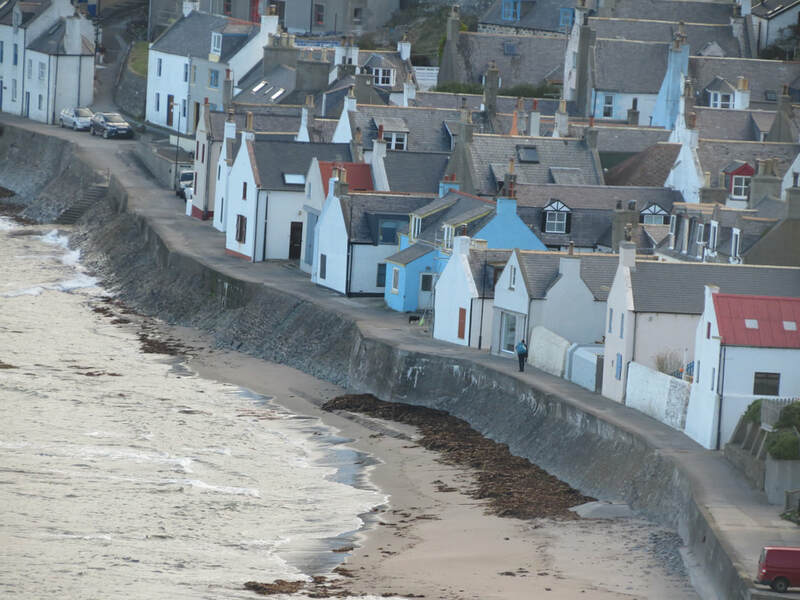 The man now lived in a city not far away and he rarely gets the chance to get back to Pennan. 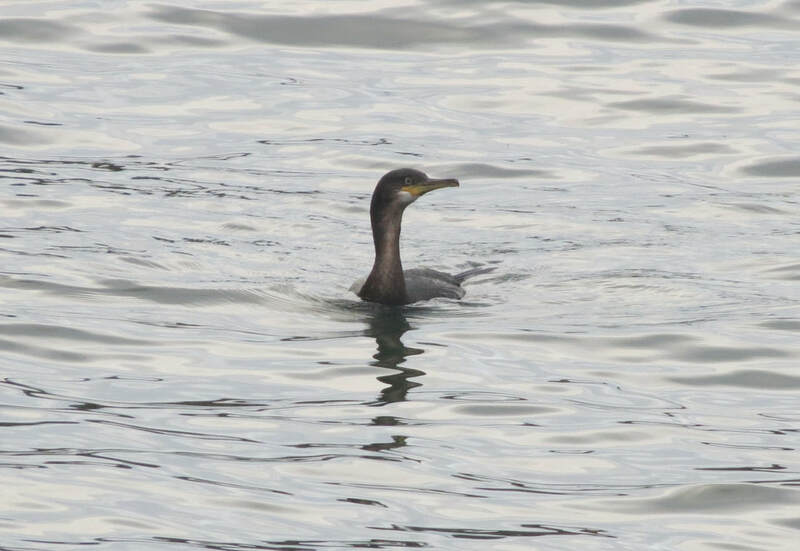 One night he was at his local pub and was talking with the owner and told him he was from Pennan. 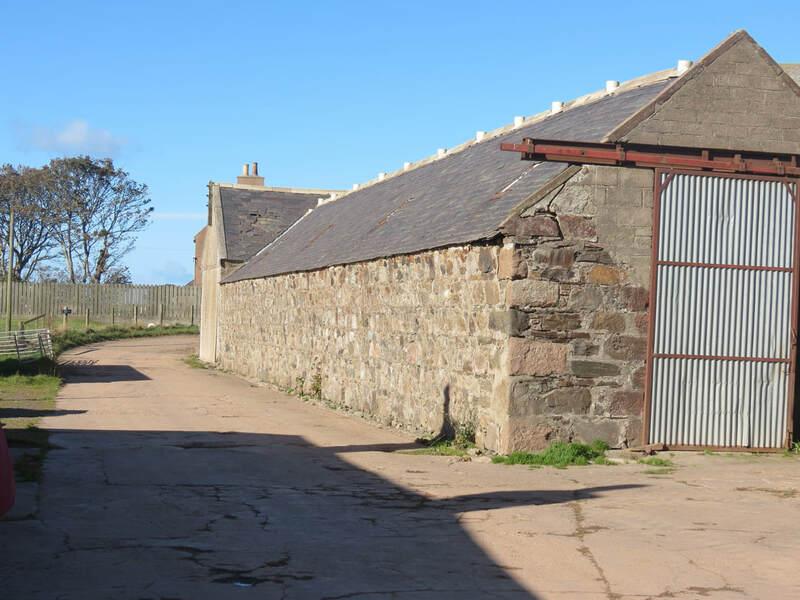 The owner said he had a picture of Pennan’s pub and then he showed the photograph to the man and there was his uncle holding the reins of a horse with a little boy sitting on top. It was him as a little boy over 50 years ago. Mary and I walked down to the end of town then turned around and headed back and met Helen who was outside washing her car. After talking for a few minutes she invited us into her house for a cup of coffee. 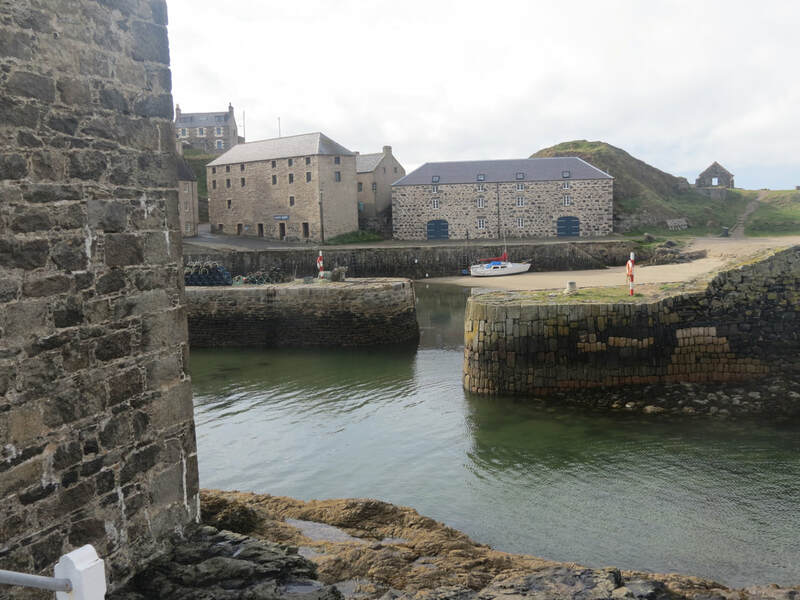 Helen was a physical education teacher in a nearby school and she told us that Pennan was the perfect place to live and that there are ten full time residents. We told her we had been to Saint John’s church and we specifically were interested in the gravestones. 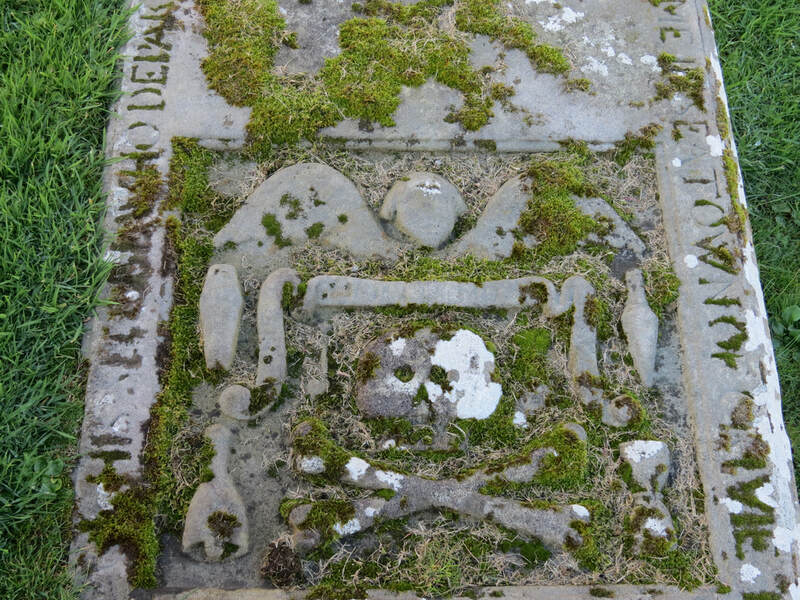 Helen told us that throughout Scotland there are skull and crossbones carved into the stones representing that the person had died of a plague. I looked this up and found that the person may have been a member of the Freemasons. She also told us that some of the stones had bells carved in them. Hundreds of years ago comas were not well understood and if a person was in a coma they were buried with a cord which was attached to a bell above ground and if the person woke up they could ring the bell to be dug back up. When it was time to leave it started to rain and Helen offered to give us a ride back to Gamrie where she dropped us off at the grocery store, where we shopped and walked back to Kathleen’s. It was our last night in Gamrie and we couldn’t pass up another night at the pub. This is the place where everyone in town gathers at night. Gamrie is a unique and special town, a town that has a road that drops off to the sea without any guard rails, where there is a row of houses right by the sea that during really high tides and storms the water can come into the houses, a town where the only grocery store is at the top of a steep hill, and a town that closes down including buses on Sunday. Unfortunately we had planned on leaving the next day, on Sunday when we found out about the closing down on Sunday. 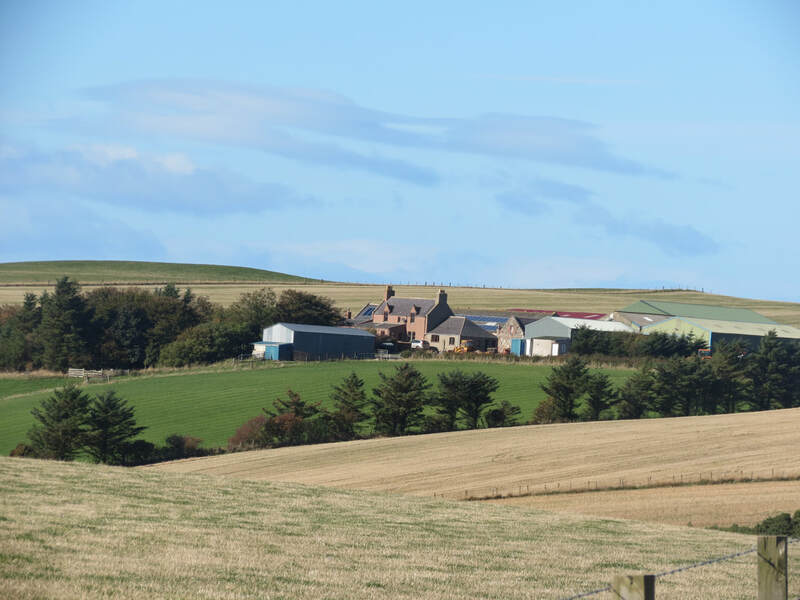 Our next destination was Ann’s house in Catterline and the only way to catch a bus to Fraserburgh was to take Steve’s taxi the next day. As Steve drove he described the history of the area, he passed points of interest, gave a tour of the fishing piers and then dropped us off at a fixed rate. In other words, he didn’t have to go out of his way to share his much loved area and culture. 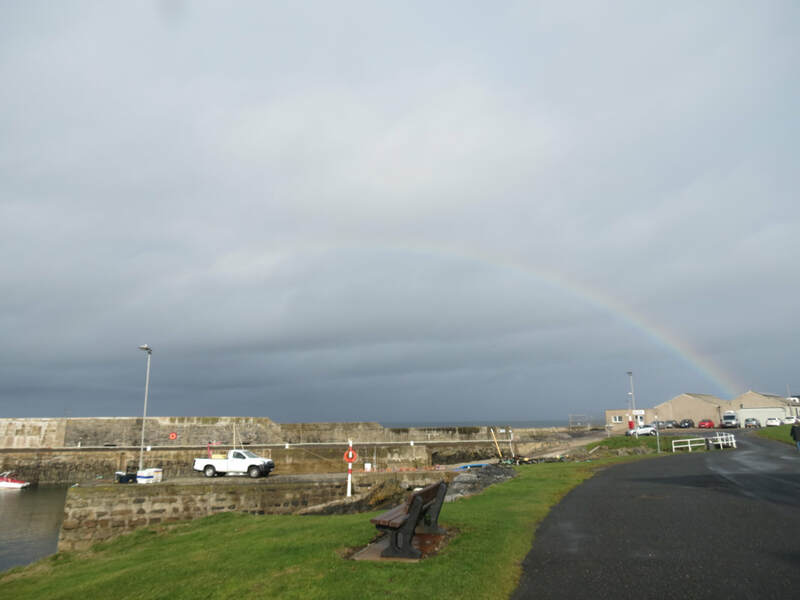 Steve dropped us off in Fraserburgh and we caught a bus to Catterline the next and last leg of our journey.